Players’ and ball’s positions captured on video. © Kijima et al. Football fascinates millions of fans, all of them unaware that the game is subject to the laws of physics. Despite their seemingly arbitrary decisions, each player obeys certain rules, as they constantly adjust their positions in relation to their teammates, opponents, the ball and the goal. 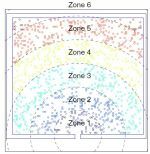 A team of Japanese scientists has now analysed the time-dependent fluctuation of both the ball and all players’ positions throughout an entire match. They discovered that a simple rule governs the complex dynamics of the ball and the team’s front-line. These findings , published in EPJ B, could have implications for other ball games, providing a new perspective on sports science. The edge of chaos—right before chaos sets in—is a unique place. It is found in many dynamical systems that cross the boundary between a well-behaved dynamics and a chaotic one. Now, physicists have shown that the distribution—or frequency of occurrence—of the variables constituting the physical characteristics of such systems at the edge of chaos has a very different shape than previously reported distributions. The results have been published in EPJ B by Miguel Angel Fuentes from the Santa Fe Institute in New Mexico, USA, and Universidad del Desarrollo, Chile, and Alberto Robledo from the National Autonomous University of Mexico, Mexico City. This could help us better understand natural phenomena with a chaotic nature. A graph depicting the children’s custody problem, where grey nodes represent couples. © Gomberoff et al. Physics can provide insights into societal trends. Problems involving interactions between people linked in real-life networks can be better understood by using physical models. As a diversion from his normal duties as a theoretical physicist, Andrés Gomberoff from the Andres Bello University, in Santiago, Chile, set out to resolve one of his real-life problems: finding a suitable weekend for both partners in his recomposed family to see all their children at the same time. He then joined forces with a mathematician and a complex systems expert. This resulted in a study published in EPJ B, showing that solving this problem essentially equates to minimising the energy in a material model. In the simulations, agents are grouped into six zones based on their initial distances from the exit. © Viswanthan et al. Stampedes unfortunately occur on too regular a basis. Previously, physicists developed numerous models of crowd evacuation dynamics. Their analyses focused on disasters such as the yearly Muslim Hajj or of the Love Parade disaster in Germany in 2010. Unfortunately, the casualties at these events may have been linked to the limitations of the crowd dynamics models used at the time. Now, a new study outlines a procedure for quantitatively comparing different crowd models, which also helps to compare these models with real-world data. In a paper published in EPJ B, Vaisagh Viswanathan, a PhD student from Nanyang Technological University in Singapore, and colleagues have demonstrated that these crowd evacuation dynamics models are a viable decision-making tool in safety preparation and planning concerning real-world human crowds. Elementary jump of an interstitialcy in an fcc Lattice. Open circles (red), before jump; closed circles (blue), after jump (Fig. 6 from the paper). The theory of interstitialcy for simple condensed matters is a theory formulated by Andrew V. Granato enable the determination of the thermodynamic and kinetic properties of simple liquids and glasses. In a new Colloquium in EPJ B the author provides a simpler, more physical and compelling version of his interstitialcy theory. In addition, the results of computer simulations, together with direct and indirect experimental evidence, are updated and reviewed. In addition, the results of computer simulations, together with direct and indirect experimental evidence, are updated and reviewed. The connection between theory and experiment for some of the more notable properties of simple condensed matter is discussed. The direct visual observation of interstitial diffusion to the surface of irradiated platinum thin films near 20K by Morgenstern, Michely and Comsa provides compelling evidence for the interstitialcy theory presented herein. Sketch of the two twisted graphene layers. © M. Sarrazin et al. Belgian scientists have used a particle physics theory to describe the behaviour of particle-like entities, referred to as excitons, in two layers of graphene, a one-carbon-atom-thick honeycomb crystal. In a paper recently published in EPJ B, Michael Sarrazin from the University of Namur, and Fabrice Petit from the Belgian Ceramic Research Centre in Mons, studied the behaviour of excitons in a bilayer of graphene through an analogy with excitons evolving in two abstract parallel worlds, described with equations typically used in high-energy particle physics. An illustration of a small portion of a square lattice. © I. Balberg et al. Composite materials are of increasing interest to physicists. Typically, they are made of electrically conducting elements - such as spherical metallic or elongated carbon particles - embedded in an insulating glass or a polymer matrix. Their controllable electrical resistivity combined with their light and flexible properties, makes them suited for applications in flexible electronics. Now, a theoretical model, confirmed experimentally, elucidates how electrical resistivity varies with the concentration of the particles in these composite materials. These findings have been published in EPJ B, by Isaac Balberg and colleagues from the Hebrew University in Jerusalem, Israel. Micro- and nano-electromechanical devices, referred to as MEMS and NEMS, are ubiquitous. These nanoscale machines with movable parts are used, for example, to trigger cars’ airbags following a shock. They can also be found in smartphones, allowing them to detect how to adequately display the screen for the viewer. The trouble is that, as their size decreases, forces typically experienced at the quantum level start to matter in these nanodevices. Mexican physicists have studied the mechanical and electrical stability of MEMS and NEMS, depending on the plate thickness and the nature of the material used. The results have now been published in EPJ B by Raul Esquivel-Sirvent and Rafael Perez-Pascual from the National Autonomous University of Mexico, in Mexico City. This study focuses on the (3+1)-dimensional spatially anisotropic quantum Heisenberg model. © M.-T. Kao et al. A new study set out to use numerical simulations to validate previous theoretical predictions describing materials exhibiting so-called antiferromagneting characteristics. A recently discovered theory shows that the ordering temperature depends on two factors—namely the spin-wave velocity and the staggered magnetisation. The results, largely consistent with these theoretical predictions, have now been published in a paper in EPJ B by Ming-Tso Kao and Fu-Jiun Jiang from the National Taiwan Normal University, in Taipei. s-SWNTs/PCBM heterojunction (Fig. 9c modified from Ref. of the paper). This EPJ B Colloquium presents an overview of the preparation method and physical properties of a new hybrid system consisting of single-walled carbon nanotubes (SWNTs) wrapped in conjugated polymers. The technique, which was first demonstrated in 2007, has attracted great interest owing to the high purity of the resulting semiconducting SWNTs and the possibility of applying them in electronic devices. Here, the authors review recent progress in the preparation of these nano-hybrids, their photophysical properties, and their applications in field-effect transistors and photovoltaic devices.